The Museo Júmex's saw-tooth roof allows for indirect natural lighting and alludes to the area's industrial past. 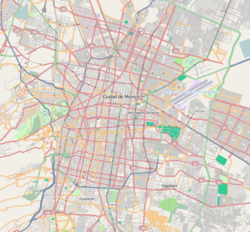 Nuevo Polanco (English, "New Polanco") is an area of Mexico City formerly consisting of warehouses and factories, bordering the upscale Polanco on the north across Avenida Ejército Nacional. Officially it consists of two colonias, Granada and Ampliación Granada. Railroad to Cuernavaca crossing Marina Nacional, 1910s. This area is undergoing an accelerated process of re-conversion and development. With a major transformation taking place, it is one of the fastest and most important real estate development areas in the country. Taking advantage of their now prime location, big pieces of land originally occupied mainly by industries are being used to build large housing, office, commercial and cultural developments with shops, restaurants, cinemas, museums, a 1,500-seat theater, a luxury hotel, etc. Many of them integrate in their name the word 'Polanco' thus seeking to capitalize on its reputation. In October 2013, the Secretariat of Urban Development and Housing (SEDUVI) put a stop to further development until a master plan for dealing with the infrastructure problems was approved. At that time the population of Nuevo Polanco was 76,000, twice as high as originally foreseen, with 23,469 housing units. Nuevo Polanco had gained attention in the international press as an example of how development can go wrong if there is no proper planning for infrastructure. Museo Soumaya, owned by the Carlos Slim Foundation. The museum contains the Slim's extensive art, religious relic, historical document, and coin collection. The museum holds works by many of the best known European artists from the 15th to the 20th century including a large collection of casts of sculptures by Auguste Rodin. The building is a shiny silver cloud-like structure reminiscent of a Rodin sculpture. Museo Júmex, opening November 2013, to house part of the Colección Jumex, the contemporary art collection of the Jumex juice company. Plaza Carso shopping center, featuring an 82,500 square feet (7,660 m2) Saks Fifth Avenue store, the second to have opened in Mexico. Together with the atrium this section measures 48,090 square metres (517,600 sq ft). Office towers, two of 23 floors each, and one of 20 floors. The three buildings are joined on the lower 3 levels by an atrium and the shopping center. The towers are: Torre Telcel - the headquarters of América Móvil are here; Torre Falcon, and Torre Zurich. Miyana, one of the largest mixed-use developments in the city, consisting of apartment buildings, a VIP Cinepolis, several stores and tens of restaurants and eating places. Polarea, located on the grounds until recently occupied the plant of Vitro, a glass factory. 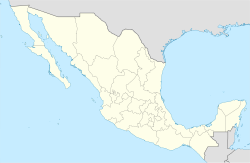 The new headquarters of the United States Embassy in Mexico will be located in New Polanco, a large complex to be built on land previously used for a Colgate-Palmolive plant. ^ a b "Carlos Slim: At home with the world's richest man". The Telegraph. 21 February 2011. (in Spanish) Ramírez, Kenya. "Alistan plan maestro para Nuevo Polanco." El Exelsior. June 1, 2014. This page was last edited on 17 April 2018, at 05:15 (UTC).